Millennials, the generation famous for wasting their potential on selfies and credit card debt, can't cook to save their lives. 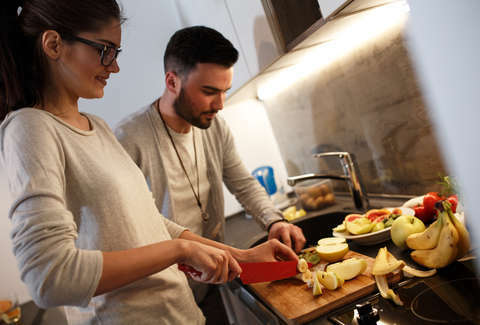 Another unflattering study, this time conducting by the home improvement website Porch.com, sheds a grim light on Millennials in the kitchen, who are apparently worse than older generations with a spatula in hand. Are you surprised that the most viciously maligned and scapegoated generation in history is bad at feeding themselves? Hardly. Porch.com surveyed 750 people across the Millennial, Generation X, and Baby Boomer generations, asking respondents whether they consider themselves good cooks, and gauging how many times people cook at home and eat out. Only 5% of Millennial and Generation X respondents consider themselves "very good" at cooking, but when you get to the nitty gritty, it's clear that many younger people are straight-up kitchen illiterate. Half of Millennials said they wouldn't be able to competently roast a chicken, which means younger people are about 30% less likely to posses the skill than Baby Boomers, according to the study. What's more, only 47% of Millennials reported being able to properly braise meat, 56% could identify a garlic press, and -- get this -- only 63.6% could identify a butter knife. On the contrary, Boomers identified these household items with aplomb; the only item that gave them pause was the Salad Spinner, which 60.3% of Boomers identified correctly, compared with 60.1% of Millennials. But, hey, we'll give Boomers a pass there, given that you can also dry salad greens with a paper towel. If anything is clear from this study, which only seems to promote fascination with Millennial incompetence, it's that young people are better at helping devalue Snapchat than making pasta. That, in a way, is something to be proud of.